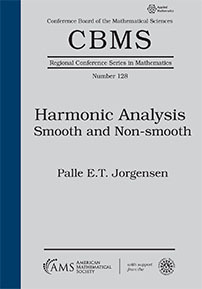 There is a recent and increasing interest in harmonic analysis of non-smooth geometries. Real-world examples where these types of geometry appear include large computer networks, relationships in datasets, and fractal structures such as those found in crystalline substances, light scattering, and other natural phenomena where dynamical systems are present. Notions of harmonic analysis focus on transforms and expansions and involve dual variables. In this book on smooth and non-smooth harmonic analysis, the notion of dual variables will be adapted to fractals. In addition to harmonic analysis via Fourier duality, the author also covers multiresolution wavelet approaches as well as a third tool, namely, \(L^2\) spaces derived from appropriate Gaussian processes. The book is based on a series of ten lectures delivered in June 2018 at a CBMS conference held at Iowa State University. Undergraduate and graduate students and researchers interested in harmonic analysis and fractals.